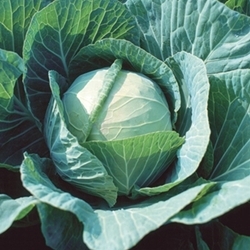 Cabbage is high in vitamin C. We offer a red variety and a green variety. Excellent for storage, cole slaw and sour kraut. Plants available in a four pack. All plants are certified organic. Select here for transplant information, pick up and order dates. Attractive, deep green, 3-lb. heads are filled with tender, thin, crisp, peppery-sweet leaves. Good standing ability in the field without splitting.